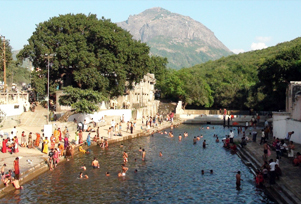 People of Junagadh believe that the like their mountain their lakes are also sacred. Damodar Kund, a lake stationed on the foothills of the Girnar hill, is one of the sacred lakes of Gujarat. People from all over the country come to Damodar Kund to perform the last rites of the departed souls and also to immerse bones and ashes in the lake. On the lakeside, one can see the temples of Damodar, Radha, Baladeva and Vagheshwari, which were supposedly made by the Suryavanshi ruler named Chandraketpur. Damodar Kund also has a connection with the famous poet, Narsinh Mehta, who was a Gujarati and a devotee of Lord Krishna. Also, worth watching is Narsinh Mehta temple, near the lakeside. Nearby the lake are two small reservoirs- Revati Kund and Mrigi Kund where pilgrims visit to get rid of their sins by taking a dip. The lake springs to life during the Shivratri festival. Also, a fair is organized on Amavasya day of Bhadarva month as per Hindu calendar. After seeing the lake, one can say that God has a major hand in the creation of nature.